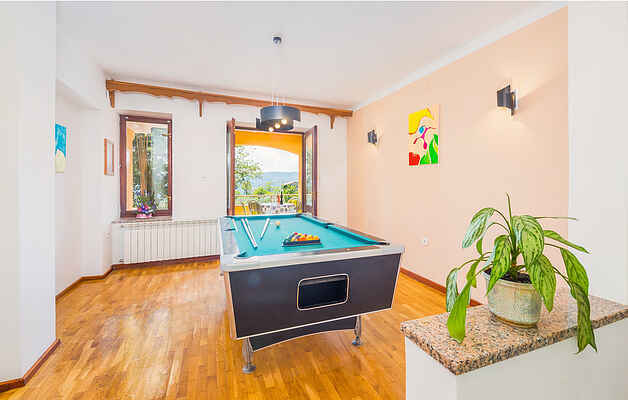 In the village of Smilovići is this beautiful semi-detached house located, furnished in a rustic style with traditional details. It consists of two separate living units. On the ground floor there are two bedrooms, two bathrooms, an additional toilet and kitchen with dining area and living room. The outdoor area is dominated by the beautiful pool, which offers refreshments during the summer months. On the first floor is the smaller living unit located, consisting of a kitchen with a living room, a bedroom and a bathroom. This is an ideal starting point to visit picturesque medieval towns in central Istria. In about half an hour driving you can reach the old town of Labin and the beautiful pebble beaches in Rabac.